We arrived safely in the Wirral on Thursday in time for our meeting at the bank. After lunch in West Kirby we were too late for our appointments at the dentist. Never mind, we needed to register with a dentist in Spain and ultimately that will be more convenient. The "girls" from Pam's school came to meet her at the Glegg Arms on Thursday night to catch up on all the gossip. Sadly Pete and Dave didn't make it which meant that I got to sit with the girls (not such a bad deal really!). Still I would have liked to have seen the dynamic duo to catch up on all the news about the Academy. The wedding on Friday ran like clockwork. The weather was just perfect, just what we had hoped for. The bride and her bridesmaids looked stunning as of course did the groom and his ushers. In the evening we joined the wedding party at Brook Meadow for a fabulous night of entertainment. The best part though was meeting up with so many friends. Saturday we went to the bride's parents' house for a BBQ. I have to say that when the Whittles have a wedding they really do it in style. The BBQ provided us with another fantastic day in the company of friends. Even Paul Ince turned up to offer his congratulations to the happy couple. Yesterday we called in to Chester for a bit of last minute shopping and a meal which our girls treated us to. Then on the way back to Manchester we called in at Pam's parents who we are glad to say looked very well. With a bit of a squeeze we have got everything into the cases. I have to confess that most of the shopping is mine and not Pam's. My excuse though is that she will be back in October and I won't. I'll leave checking the bank account until we get back - I don't want to spoil our last day! We have had a fantastic ten days and would like to thank all those people who have made us so welcome. We have thoroughly enjoyed your company and look forward to seeing you again real soon. Sunday we went to Hugh and Angela's for their son Andrew's 17th birthday party. It was fantastic to see so many friends and catch up with their news. Hugh's cooking on the BBQ was up to his usual very high standard and of course there was a plentiful supply of wine to keep the conversation flowing. Angela didn't want us to leave and we didn't want to go but Laura had to get up for work next day. Monday was supposed to be a quiet day for us. Laura went to work on the Metro and left us with her car and house keys. We went down the road to get her a hanging basket and some plants for her backyard. We called at Sainsbury's on the way back for supplies. When we got back to Laura's house though the key she had given us wouldn't work. Fortunately the lady across the road saw our plight and let us phone Laura at work to see what we could do. The solution was to drive into Manchester city centre and collect Laura's own keys. By the time we had done that they day was gone. So much for a relaxed day. Tuesday we went over to see my father in Cawthorne. When we arrived he was obviously still alseep because the doors were locked and he wasn't answering the door. We assumed he had gone out. Fortunately it was sunny so we sat outside for an hour and a half until he eventually opened the door. My brother Brian came over later which meant that the whole family could have a real good chin wag. I'm pleased to say that both my father and brother looked very well. In the late afternoon we set off for Hathersage to meet Glenys and Peter. I must have set my sat nav system to plot the shortest route because from east of Sheffield it took us along these twisting minor roads with steep 60 degree bends. It did get us there but for a time it was just like being on a rally - not the stress free journey I had hope for. It was worth it though because the hotel we stayed in was superb. We had an excellent meal last night but more important it was really good to see our friends again. Today we went with Glenys and Peter to tour the beautiful area of the Peak District. There is such a contrast between the lush valleys of Derbyshire and the coastal plain of the Vega Baja. We love both and wouldn't want to miss seeing either. Many thanks to Glenys whose idea it was to meet in Hathersage. I was careful to program my sat nav to give me the fastest route back to Laura's to avoid yet another rally stage. Tomorrow we go the Wirral where we will stay until Sunday. After a bumpy flight we arived in Manchester on time. They still haven't sorted out passport control there so we had to queue for ages. The good thing is that by the time we got to the carousel our cases were there. Yesterday we went shopping - of course! Manchester was very busy but had a very continental feel to it. There was street entertainment and carnival parades to break up the hours spent in Marks and Spencer etc. The sales assistant must have wondered why I needed four pairs of swim shorts. When that is the only thing you wear for four months of the year and they are soaked in chlorine day after day they just don't last. Now I haven't been to the pictures for years so last night was a novel experience. We went to the Trafford Centre and watched Pirates of the Carribean Dead Man's Chest. It is a very entertaining film and well worth going to see. I'm not sure we needed so much popcorn though. All that hype about the weather being better in England than in Spain is rubbish. It is warm but just comfortable. More like Spanish Spring than Summer. If you choose where to go carefully you can eat well at very little cost here in Spain. Our friends John and Jean are very good at finding good value food. Yesterday they introduced us to a restaurant in Algorfa where we an excellent lunch for 7,50€ (just over £5). Typically the good value meals are "menu del dia" and offer a limited choice of first and second courses including a plate of salad, a drink and bread followed by either a dessert or coffee. I always think the first course is the most interesting because it varies widely from restaurant to restaurant. The second course is usually a fillet of chicken, fish or pork accompanied by chips (no vegetables). The dessert is usually flan, tart, ice cream or rice. When we go to Guadamar we eat at the Canada Bar which offers a similar deal and again provides excellent value for money. I thnk the clue is to see how many Spaniards are eating in these places at lunchtime. By 2:30 the place we went ot yesterday and the Canada Bar are usually packed which we take to be a good sign. Just as we used to get excited about going on holiday to Spain we now get excited about going on holiday to England. Of course our trips to England are much more than just a holiday. They are our chance to catch up with friends and relatives. This trip is special though. Not only do we get to see our daughters Jemma and Laura, we get to see Angela, Hugh, Andrew and their friends at Andrew's party. We'll also see our parents of course. Then we have a night in a hotel in Hathersage where we will meet up with Glenys and Peter. Glenys and Pam have been friends since they were schoolgirls at Hoylake a few years ago! Pam is going to meet up with some of the "girls" from the school where she taught and I'm going to meet Pete and Dave who were very good to me and kept me sane at Anfield. Then we have the wedding of the year to attend where Laura is to be bridesmaid. No doubt we will come back exhausted but with some very happy memories. We should also have some photographs to share with you on our return. The road down to Bigastro is set to get worse. They are digging it up again including the speed bump which they have just painted. 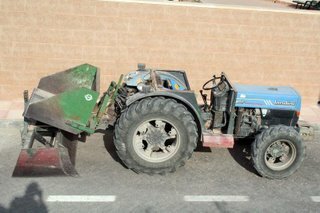 Even still a tractor as a mode of transport is a bit over the top. Notice that this model comes with full air conditioning and lots of space for shopping. Actually this is the b**** that they start up every morning at 8:30 just to make sure we are awake. It is what they were using to level the plot next door. Having levelled it and put the steel mesh down; this morning a big crane arrived followed by a lorry load of ready mix. They used the crane to get the ready mix down the other side of the plot. Then an even bigger crane arrived which they used to get the concrete over the house and onto the back of the plot. Whatever happened to the good old wheelbarrow method of moving concrete? Hopefully by the time we get back from our hols the job will be finished. On May 24th I mentioned that Bigastro were offering a prize of 200€ for a picture that promoted breast feeding. I wonder if they got any takers and if they will publish the results. I noticed there was a lady in the Social Services office in Orihuela on Tuesday who was feeding her baby whilst she was waiting her turn. Maybe I should have had my camera with me. I could have been 200€ better off now. According to reports temperatures in Britain could reach 39 degrees C today (well that is according to the Sun). Temperatures here are forecast at a more moderate 32 - 33 with some light cloud. If Britain is going to have these heatwaves on a regular basis then maybe it's time to start adopting a more Mediterranean way of dealing with weather. Typically we British are caught unawares by heatwaves and adapt very slowly to them. The main problem is that, as a nation, we don't dress and regulate our lives according to the weather. Of course we have the advantage that all cars, buses and trains are air conditioned as is any shop which wants customers. There are plenty of areas of shade particularly around bars and restaurants and we have a siesta in the middle of the day. Come on Britain gear up to the sun - dig up those oaks and plant some palm trees. Last week we went to Orihuela to the Social Services office to get our E111 cards in preparation for our trip to England. When you leave England you loose your entitlement to treatment there unless you have an E111. Exactly the same as when we came to Spain on holiday from England but in reverse. Apparently you only need your medical card from the local doctor's and you get the card there and then. Last week we were politely turned away and told to come back this week on Tuesday. We were advised to arrive early because there would be "mucha gente". We know exactly what that means from our experience at Trafico. Of course Tuesday is market day so that will add to the problem. Update:- After negotiating the market traffic and queuing for an hour we were told that only "pensionistas" are entitled to an E111. Clearly the lady could see we were much too young to be receiving a pension! Still it was good to get away from the noise of the builders next door. They started at 8:00am this morning. Whatever machine it was they were using was shaking our house. Thankfully that has stopped and the house is still standing. Then we are going to Los Montesinos so that Pam can have her eyebrows done and hopefully to Torre to get the new lenses for my glasses. New lenses arrived last week but unfortunately came without the anti-reflective coating that I had ordered. That will be enough to exhaust us sufficiently to need a long sleep on a sunbed this afternoon. Este lunes y martes quedan suspendidas todas las actividades en el Centro Social Integrado debido a tareas del fumigación. I'm glad we don't have to go down there to surf the net anymore. I wonder what they are fumigating for. Not the Brits I hope! Update:- Thanks Mel for that information. Apparently they are fumigating for cockroaches and fleas. NICE!! By the time we visited the house to choose tiles etc. 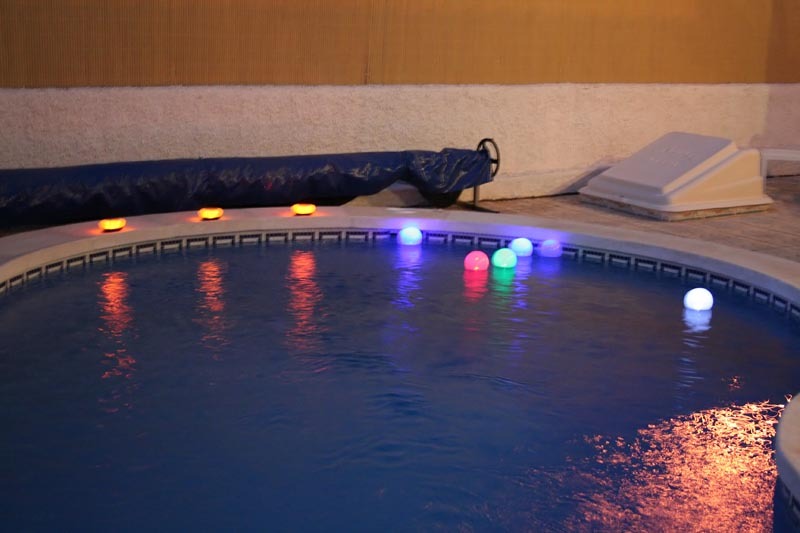 the pool had been built so it was too late to ask for an underwater pool light. So we have to make do with floating lights. Don't you think they look pretty though? We're still trying to work out who exactly has bought the house next door. Previously we have had various people come for an hour or so to use the pool. One lot had two very noisy lads with them so we hoped it wasn't them. Yesterday afternoon, as we were lying by our pool, we heard a couple arrive in seperate cars. We then heard them going inside so they obviously had a key. They stayed for about an hour and a half and then left. Draw your own conclusions from that - we have! This morning the blokes who are doing the garden are back so we assume someone has bought the house. We're just not sure which of the people it is. Probably not the couple who came yesterday though! This hot weather does make you sleepy. Half an hour of work and you need a drink of water and a sit down for a rest. The workmen next door had finished early yesterday because it was Friday, so peace reigned over Calle Irlanda. The quiet and the balmy heat allowed Pam to sleep for about two hours in the shade of the porch. It must have been about 6:30pm when she appeared by the pool ready for a cup of tea and a swim. Forget the adage that says "if you sleep in the daytime you won't sleep at night". Pam slept for a further ten hours last night. My theory is that her body is preparing itself for the trip to England when she will be lucky to get eight hours sleep a night. Thinking about our trip to England - what clothes do we bring? The weather reports at the moment are good but will it last? We well remember wearing fleeces at Andrew's previous parties. There is no room in our cases for those. One thing is for certain, Pam will need to wear something warmer than a bikini to sleep outside Laura's house in Sale. En los próximos días dará comienzo las obras del nuevo depósito de agua que estará ubicado en la zona conocida como "Lo Chusco". Esta nueva infraestructura hidráulica, gracias a unos mecanismos de impulsión hará posible impulsar el agua hasta la zona recreativa de la Pedrera de manera que podamos mejorar el servicio y la presión existente en el Casco Urbano de Bigastro y además prestar servicio a las nuevas urbanizaciones que se están realizando en las zonas de ampliación. Which means that they are installing a new water tank with an impuse drive to increase pressure to the town and supply water to the new developments. At the same time that Bigastro is increasing the water pressure they are slowing down the traffic. New tarmac "sleeping policemen" have been laid in the town. The one which amuses us though is the one on Avenida Europa. This is the road where John and Jean live and is on our route out of Villas Andrea. A few months ago they dug up one side of the road to lay pipes to take rain water from our estate to the huerta. They filled the trench in with soil and kept topping it up when it washed away with the rain. As you can imagine, every time a vehicle drives fast over the dry soil a cloud of dust rises to fall on their houses. The residents have complained bitterly to the the Town Hall but were told there is no money to resurface the road. As a token gesture though they have a "sleeping policeman" to slow the traffic down. It is the only decent piece of tarmac on their road! We wouldn't want anyone to think that living in Spain is perfect. There are downsides. One of those is the abundance of insects. 1. The ants which come in all sizes from so tiny you can hardly see them to quite big. They don't cause us a lot of trouble but are almost impossible to get rid of permanently. 2. The wasps which were trying to build a nest in one of the yuccas until I gave them their marching orders. They are definitely nested somewhere in the garden though. They come down to the pool to drink. The clever ones just touch the surface and keep their wings out of the water. When they have finished they then fly off. The dumb ones get stuck and have to be removed (carefully). Pam has been stung by one and so did one of our guests. 3. The crickets cause two problems. They eat the leaves on the plants and they make a damn row when they are rubbing their legs together. When you hear the noise at first you would imagine it is a serious electrical fault. When you find the insect responsible it is hard to believe it can make so much noise. Tolerable in the daytime but not funny if they start making their row at night. 4. The flies which come out in the heat and buzz round you. Presumably they are attracted by the sweat. When you swat them they just circle round and come back. They are cheeky! It is bad enough when they settle on your body but when they persist in buzzing round your face it is really annoying. 5. Mosquitoes. We never got bitten on our holidays on the Costa del Sol. When we were buying the house though we were asked "did we want mosquito nets". Now we know why we need them. I currently have 5 bites and Pam has six or seven and we have nets. The problem is that the insects are so small they are easy to miss. You don't miss them once they have bitten though!! What I want to know is why do they have to irritate so much. Why can't they just take the drop of blood they need and leave you with a little mark where they have been. The mark would heal up and we'd all be happy. We have special cream which reduces the itching but it still takes a couple of days for the bites to clear. Mosquitoes are top of our list. 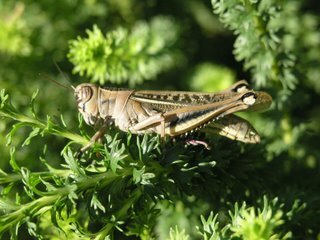 There are other bugs like the dragonflies and the processional caterpillars which are even more undesirable but fortunately they don't come into the garden. 1. The house next door was sold on May 10th but as yet nobody has moved in - most strange. John, the previous owner, thought that the estate agent had bought the house to possibly rent out. We don't know for sure but think now that is not the case. First of all the pool was finished and filled. Then people started arriving - sometimes just for a couple of hours. Some of them came to use the pool, others went in the house. 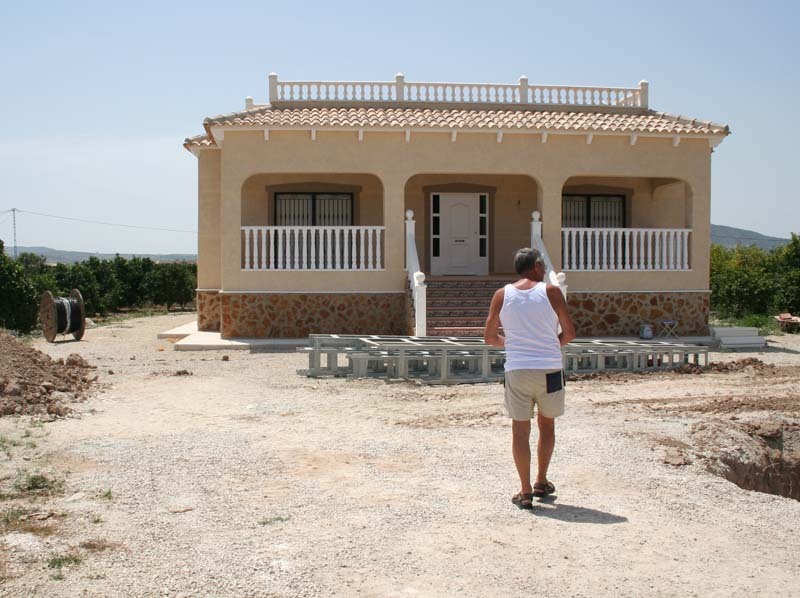 One Spanish couple with a young girl came often so we think they may be the new owners. The other day building materials arrived and finally on Monday evening a digger trundled in. Yesterday the digger, a tractor and a lorry spent all day clearing the land around the house in preparation for what we think will be terracing. We're going out today to the beach - at least there we will be able to get some sleep as we lie in the sun. Trying to sleep yesterday with a digger working six feet away was impossible. 2. Following a flurry of deliveries, there are now cleaners working on the builder's house just down the road. He'd already told us that he intended moving in by the end of July. So by the time we return from our trip to England all the houses on our Calle should be occupied and we will be the only English family living in the smallest of the houses! Bigastro has its own cultural programme for July. It's a pity we missed the three ladies from Madagascar. I wonder what La Banda del Pepo will be like? 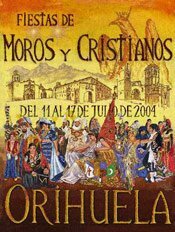 Around the 17th of July Orihuela celebrates the festivity of the Re-conquest. This celebration, - which was first recorded in 1400-, remembers the Christian re-conquest of the city on the 17th of July 1242. The celebrations in 2004 marked the 30th anniversary of the incorporation of the Moors and Christian and so were apparently even more spectacular than usual. Last year we saw the parade of the Christian groups, this year we will go and see the Moors..
No not the mens' final at Wimbledon, the World Cup final in Berlin. What can we say:- the grass looked perfect and the fireworks afterwards were spectacular. The best team won on the night. We should all be able to settle down and watch the Tour de France. It was good to see a Frenchman win a stage and touching that he should carry a picture of his son in his jersey pocket. Pity though that the favourites are absent. Stage 10 Cambo les Bains to Pau should start to sort out the real leaders. "IBERDROLA nos informa de que el próximo día 8 de julio (domingo) se producirá un corte eléctrico en la zona de la Cañada de Andrea y la Calle Joaquín Moya Martínez, de 9 a 11 de la mañana. " So was it to be sabado the 8th or domingo the 9th? The answer came this morning when, true to their word, Ibderola cut the electricity off for about two and a half hours. Just as well it wasn't longer because in these temperatures the food in the freezer soon starts to defrost. Fortunately I had just made a cup of tea otherwise we would have had to start the day grumpy. As it was I had to wait until nearly 12 o clock for my cup of coffee. I can almost hear the great cry of "shame". My simple translation is that "shooting of wheelbarrows" is prohibited during fiestas. Make sense of that!! Further research shows that a "carretilla" could be a shopping trolley rather than a wheelbarrow. Disparo is a noun meaning "shot". I'll just have to look out for any "shot trolleys" during the fiesta. 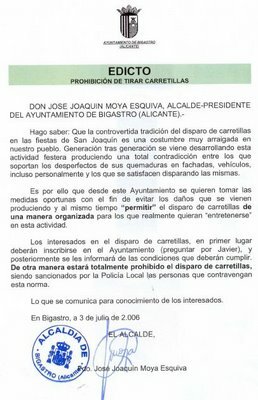 Guardia Civil officers stopped and fined 259 drivers in two days in Alicante Province which will lead to the loss of over1.000 points from their licenses. The point-losing offences reported by local police forces are yet to be added to that figure. Drink driving and not using seatbelts were at the top of the list, followed by motorcyclists not using crash helmets. Seven people were stopped for using a mobile phone at the wheel. As for the battle of the sexes, serious offences committed by women represent only a tenth of those committed by men (237 men, 22 women). In the whole of Spain, 18,324 points were lost by almost 5,000 drivers. Hopefully they will tell all their friends and we might just see an improvement in the way they drive. Of course Pam and Jean are well blessed but that is not what I am referring to! We count ourselves lucky to live in an area that has so much to offer. Bigastro is such a friendly town to live in. Then we have Torrevieja which is lively and has a pleasant promenade and Guadamar which has a splendid beach and a large dune area. Within an hour we can be in one of several large cities. Elche has a great history and the huge palm forest, Cartegena has its port and maritime history, Murcia and Alicante are large and cosmopolitan with all the facilities you would expect in a major city. Behind the coastal plain there are mountains followed by more mountains. The scenery as you travel up the coast towards Benidorm or down past Murcia is quite spectacular. There are two ways that you can change your UK drivng license to a Spanish one. The first is to go to one of the agencies who will do it for you for 50€ or you can do it yourself for 16,50€ (the actual cost of the transfer). We chose to do the latter with the help of our friends John and Jean. The nearest Trafico office is in Alicante. Rather than try to negotiate the traffic and find somewhere to park we went there on the train from Orihuela. At 4,50€ for a return ticket it was probably cheaper than paying for the diesel and the parking fees and was a damn sight less stressful. The system is well organised in that you go to the Informacion desk and get the forms you need. Having filled them out you go to the Caja and pay the fees. You are given a numbered ticket which indicates when it is your turn to be seen. You watch the board for your number and when it comes up it shows you which Ventanilla to go to. There you present your documents and if they are all correct come away with a temporary license. 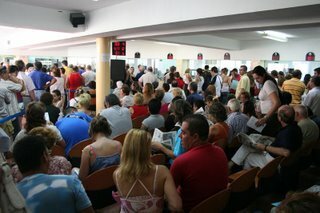 As you can see the place was full of people changing licenses, renewing licenses etc etc. The office is only open from 9:30 am to 1:30 pm and deals with hundreds of people in that time. The English book we have tells us that you need one photograph, your residencia card plus a photocopy along with your old license plus a photocopy to complete the procedure. In fact you need two photographs, your old license plus two photocopies and a photocopy of both sides of your residencia card. 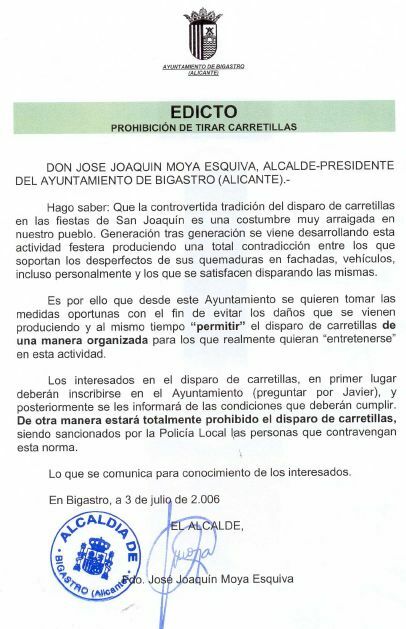 In our case because the address on our residencia cards is the plot number rather than our actual address we also had took copies of our Certificado de Empadronamiento (our registration document from the Town Hall in Bigastro). Luckily the lady accepted our documents and gave us each a temporary Permiso de Conduccion. The plastic card licenses will arrive sometime in the future. The whole process took us two and a half hours. Afterwards went for a drink and then onto a restaurante for a delightful lunch. Apparently there are two branches of El Corte Ingles in Alicante so we visited both. Then weary but satisfied that we had accomplished what we set out to do we returned to Orihuela on the train. That was a so so game last night. The first half was interesting but the second was scrappy. I bet Ricardo Carvalho had very little sleep. It was good to hear the crowd booing Cristiano Ronaldo after his behaviour in the England match. Did he forget that he plays for Manchester United in the Premier League and has to face home crowds next season? Pam says he is good looking so should be forgiven - I think not! Yesterday was glorious on the beach. Although the maximum temperature was 36 degrees, there was a strong breeze blowing to keep everyone cool. It is getting more crowded though and we did have to park further away. As I have said August will be impossible so we'll make the most of it during the couple of weeks in July that we are still here. We're off to Alicante today to hopefully get our Spanish driving licences. So it is an early start for us this morning. Pam is up and getting ready as we speak. Pam and I could almost become football fans after this World Cup. Last night's game between Italy and Germany was, as the commentator on Cuatro said, "buenisimo". Good attacking play from both sides, especially the Italians during extra time, made it exciting. That is more than could be said for most of England's games and at least, on this occasion, the losing side don't have to catch the plane home. Anyway we've now decided that although we can't back a Spanish speaking country we're pretty sure it will be a Mediterranean one that will win. Should we buy champagne, cava or spumante to celebrate? We went down yesterday to the local post office in Bigastro to post my digital camera to the winning bidder. Unfortunately the package was too heavy to post in Bigastro. Antonio, the Postman told us we needed to go to Orihuela to the main post office where they could deal with it. When we got there we had to conduct the whole transaction in Spanish and we managed very well. It would have been better if I had thought about what to say when we arrived at the counter rather than just plonk the parcel on the counter but that will come. "Puedo enviar este a Inglaterra" would have been better than stunned silence. Still we are making progress and that is all that matters. That's the end of that. Beckham has resigned and Eriksson has left. England are £20m lighter with nothing to show for it. Ah well maybe we have learnt the lesson but then again maybe not. Yesterday we went with friends to look at an interesting house out in the country. Very nice it was too. It is a good size villa on a 3000m2 plot with spectacular views of mountains. With just orange groves around it, the house will be a haven of splendid isolation for whoever buys it. After the trip, our friends came back to our house and we had a very pleasant afternoon around the pool. I cooked them my paellla which they thoroughly enjoyed We chatted, ate, swam and sipped sangria until the sun went down. An excellent way to spend a Sunday. We'll see them again on Thursday when we are going to catch the train from Orihuela to Alicante. John is going to renew his HGV license and I hope to change my English driving license to a Spanish one. You can bet we'll be having a spot of lunch somewhere and the girls will want to look around the shops. Sounds like another good day to look forward to. What can I say - our lads are on their way home after 120 minutes of brave effort. Rooney will be kicking the cat (hopefully not stamping on its tender bits) and Lampard, Gerrard and Carragher will be kicking themselves. Brasil must be feeling dazed after coming up against a brilliant French side. So who do we fancy to win now? No se. The eBAy auction for my camera has now finished. As I had hoped there was a flurry of bidding in the last minutes of the auction which pushed the price up nicely. I had considered getting Jemma to take the camera back to the UK to post it from there. As it happens I had bids from Spain, Germany and England and interest from Italy but the eventual winner comes from Solihull. Jemma lives in Wolverhampton so could have delivered it personally. Still not to worry I'll go down and see Antonio in the Post Office on Monday and get the camera on its way. Spain now has points system for drivers similar to those used in the UK, France and Germany. In Spain drivers begin with 12 points and offences incur the loss of points plus the corresponding fine according to the offence. Throughout this last week, motorists who were stopped for committing an offence were informed by Guardia Civil traffic officers of the number of points they would have lost. Driving without a seatbelt, using a mobile phone at the wheel and speeding topped the offence list. The DGT told CBN that the new legislation will not affect licences issued outside Spain. Drivers with these licences who commit an offence will receive fines as before. This weekend marks the start of the holiday season. Tailbacks of several kilometres on roads out of major cities and entering tourist resorts are expected from Friday evening and throughout the weekend.The DGT expects around nine million traffic movements throughout Spain from yesterday afternoon until midnight on Sunday, the majority being vehicles heading towards the coast. Just imagine how many euros they will collect and how many points will be deducted during that period. Judging by the way some Spaniards drive, by Monday some of these people could have 0 points on their licenses. The festival of San Juan in Alicante finishes this weekend. The final event, Hogueras is similar to the Fallas fiesta in Valencia. Originally the event involved the towns' people gathering items such as old furniture and piling them onto huge bonfires. In 1928 one Jose Maria Py decided that Alicante deserved a fiesta like Fallas and set about creating Alicante's biggest party of the year. Tonight Alicante will be ablaze. As the clock strikes midnight on the 'Noche de San Juan', a spectacular firework display will be launched from the Castillo (castle) de Santa Barbara This is the signal to light the hogueras which are giant satirical effigies, constructed from papier mache, wood and cardboard and representing each of Alicante's 86 barrios (neighbourhoods). Apparently the flames from the fires reach more than 10 metres into the sky. Once the fires are burning well the people begin to hurl insults at the bomberos (firemen) encouraging them to spring into action, dousing the crowds with thousands of gallons of water and extinguishing the hogueras. In typically Spanish style, the party continues in the barracas (street bars) until four in the morning and maybe even a disco to round the night off. We have to support England in their match against Portugal and then we are going to a birthday party up at the Pedrera so we will miss it. Mind you my ears still bear the scars from the fireworks in Valencia so maybe it isn't such a bad thing. I never thought I'd have to move to plan C - damn the Germans for being so clinically thorough. The obvious choice is Brasil but then they have been the front runners from early on. I'd rather back an underdog. I don't suppose England have a chance - or do they?